So, despite being aware of its intimidating 3-hour length, with an open mind, I decided to watch the Bill Nye vs. Ken Ham debate last night. For a better focus I chose a time when everything around was super quite (0000 hrs to 0300 hrs) and hence, I was able to attentively watch it right from the first second to the very last second. Before starting, I had my mind cleared of all the prejudices and was ready to embrace the most logical points coming from any one of them. Yes, I was even willing to accept that the earth is six thousand years old, if Ken Ham would have produced sound arguments. Although there were no winners or losers in that debate, for me, Bill Nye’s arguments were clearly moving – in the sense that he was able to take me on his side with sound arguments and very specific data points. Specifically, both of their answers, for one question asked from the audience was probably a turning point in the debate. When some one asked – What would make you change your mind? Bill told the audience to bring in sound evidences and they would change his mind. Ken Ham disappointingly suggested that nothing could change his mind. Clearly, a person who was willing to accept good evidences to change his beliefs was the winner for me; not a stiff/adamant person. All said, Ken ham was not able to persuade me to accept his argument that the world was around six thousand years old. In fact, at the end of the debate when both of the speakers were done, I observed that Ken Ham silently moved into the darker background and surprisingly (surprising because it was Kentucky), several people from the audience started approaching Bill Nye for a handshake or an autograph. Although, it wasn’t clear why they had approached him, whatever it was, it was definitely some kind of an appreciation for Bill. Evidently, people were impressed with his arguments. Also, not being well aware of the Christian belief, during an online discussion after the debate, I was surprised to find that despite having embraced Christianity, there is a chunk of Christian population that believes the world is indeed several billions of years old (It is the Creationists who believe in six-thousand-year-old-earth theory). This chunk of Christian population was on the side of Bill Nye. So, this was not a God vs. Science debate. It was exactly like it was advertised – Bill Nye vs. Ken Ham. Christians (31.59% of the world population): The ones who interpret the biblical writing in a literal manner believe that the Earth is six thousand years old and discard the theory of evolution (molecule to man). However, there is a huge chunk of Christians, with a background in science, who firmly believe that the earth is indeed several Billions of years old and also to an extent, believe in evolution. Muslims (23.2% of the world population): According to this about page, Islam does not take a fixed stance on the age of the Earth. They prefer to leave the knowledge to their deity. Their holy book, Quran describes that the creation of Universe took “six days”. Again, according to them, at that time, as the definition of day could have been different than what it is now, especially when the Sun did not exist then, they do not like to say that the universe got created in 6 x 24 hours. In other words, they have a view very similar to the Biblical writings, yet are pretty flexible about accepting new theories on the age of our universe. Hindus (15% of the world population): Among all the three, Hinduism, the third most followed religion, has a lot of new things to say about the age of the universe. Since 95% of followers of this religion live in a single country, and the religion itself isn’t missionary in nature, its views are not popularly known all over the world. Personally, the Hindu religion and the vast amount of documented science it has in its ancient holy books fascinates me more than any other extant religion (not more than science, if you consider it a religion). The religion believes in a circular time rather than a simple linear time-line of the universe and suggests the universe is several trillions of years old. In fact the “kalp-chakra” – the life span of the universe – it mentions is the largest measure of time known to man. And the end, it states that the universe collapses and gets created again. The fundamental books of Hinduism, the Vedas, are huge, believed to be around 3,800 years old and comprehensively document numerous mathematical and scientific calculations. These books contain writings that cover topics from almost every science or maths subject known to man. In fact, they depend so much on mathematics that the holiest Hindu number is believed to be 108 which is probably the most beautiful number in mathematics. Most God-believing Hindus accept the theory of biological evolution. They either regard the scriptural creation theories as allegories and metaphors, or reconcile these legends with the modern theory of evolution. If you ask me, Bill Nye was a winner in the debate because of the all embracing state of mind he held all along – as long as you can bring in logical evidences to prove your ideas. Although Hinduism fascinates me to a great extent, I’m not a religious person. My views about things are in line with Bill Nye’s views – I’d believe in anything as long as you can show me a valid and logical proof (arbitrary or literary interpretation of written verses from a book aren’t valid proofs). Moreover, I’d be ready to even modify my views over and over again as long as you keep bringing me evidences that disprove the older views. That is how science works, that is how logic works and that is what Bill Nye believes in. 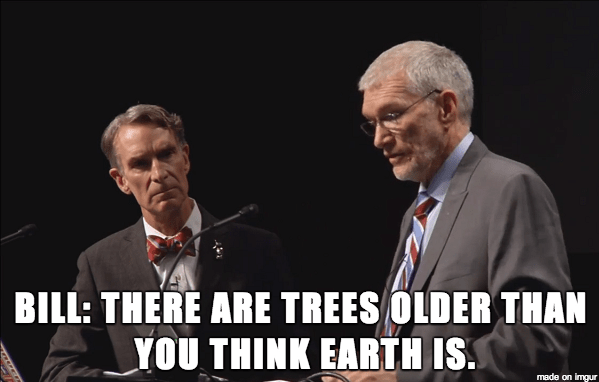 The Bill Nye-Ken Ham debate.